ATLANTA — Filter manufacturer Donaldson Co. has introduced a wireless monitoring system that tracks and reports on the condition of trucks’ air filters, and which eventually could be expanded to track other systems, the company said. 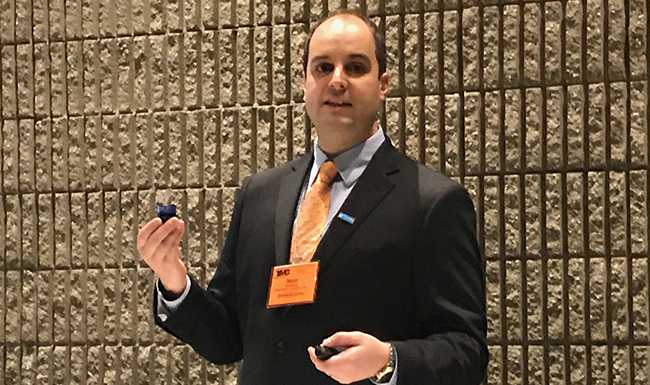 The filter manufacturer’s Filter Minder system — which it showcased during the American Trucking Associations 2019 Technology & Maintenance Council annual meeting here — integrates with a truck’s existing telematics system, and can transmit data on a filter’s condition and performance to help fleets maximize service life, Nate Zambon, director of the Filter Minder product line, said during a press conference. He noted that while some fleets change filters early to avoid problems later, that method can be inefficient. “That works — you don’t have any unplanned downtime servicing your filtration system early — but I would say that there are a lot of costs associated with it,” he said. “You’re essentially wasting filters.” And changing them too late, he said, can lead to increased instances of diesel particulate filter generation, and, potentially, unplanned downtime. “It just becomes that much harder for the engine to work,” he said. Zambon noted that the data collected will be sent to the company’s data science team, which will perform analytics for customers. Currently, there are several dozen trucks with OEMs and fleets conducting pilots of the product, he said. Zambon added that Donaldson acquired the manufacturer of Filter Minder in 2015 and has an eye on expanding the product for monitoring of other systems, including engine fuel, lubricants and hydraulics. “Our compass has to point to what creates value to customers,” he said.